A wide-ranging book provides an account of many supernatural interactions. 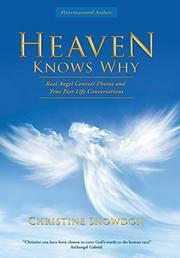 The latest collection of insights and anecdotes from Snowdon (Touched by Angels, 2010) springs from her conviction that there are 40 angel realms in humanity’s universe and more than 200 outside it, and that she is being guided by angels to pass on their communications and help enlighten people and encourage world peace. Angels of all types and descriptions crop up throughout this volume, where they function more as supernatural forces than religious beings. Indeed, although Snowdon asserts (in a claim atheists should find familiar) that without the goodness of God, earthlings “would all be mindless creatures” who selfishly grab “whatever we can from our friends, our neighbours, and our loved ones,” the universe described here is an openly polytheistic one. Pagan deities like Apollo, Isis, and the goddess Brigid (“known to have evolved from various deities in the past to a modern-day goddess of peace and unity”) jostle for space alongside spirit guides, fairies, and unicorns (including Snowdon’s “guardian unicorn” named Greta). According to the author, this menagerie interacts with chakras, auras, and alternate dimensions, and regularly communicates with Snowdon. She sees their intercession and guidance in everything, from genetically modified foods (“GMO food has been inspired from the spirit realm because of animal-contaminated food,” she’s mystically informed. “It is the way forward for planet earth”) to random cloud formations (the book includes several photos). The writing style throughout is both accessible and enthusiastic, shifting from personal stories and anecdotes to broader mystical claims and back with ease. Snowdon ends each short chapter of this fairly standard New-Age stew with an “affirmation” (for example, “Each morning for a short while, I imagine being lifted up into a realm of angels who help keep a feeling of harmony with me through my day”). Readers will necessarily have to be of the angels-picked-my-airplane-seat-number mindset themselves to appreciate any part of the work. Snowdon’s book may very well be the only one ever published with a cover blurb by the Archangel Gabriel. A life-affirming glimpse into a personal world thickly populated with fantastical forces.